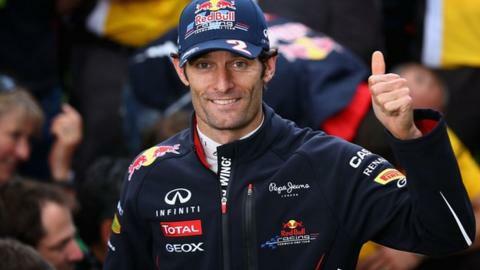 There is no doubt that Mark Webber is back as a major contender for the Formula 1 championship after his victory in the British Grand Prix on Sunday. When Webber struggled in 2011 while team-mate Sebastian Vettel dominated, lots of people wrote him off and said that 2010 was his last chance to win the title. So they have been surprised that he is competitive again this year. But it is the other way around for me - I was surprised by last year. Webber has always been a very good, fast driver. Even though I was driving for Red Bull's sister team Toro Rosso last year, I have no idea why 2011 went the way it did for Webber. It's very difficult for anyone outside a Formula 1 team to know why one driver is struggling compared with another. But Webber is experienced in Formula 1 and that is a big factor when it comes to being successful. He has been there for many years and has driven for many teams. He knows the people very well, and how they work, and his position at Red Bull is perfect for him. Webber knows how to deal with every single situation in which he finds himself in the team. He got his opportunity at Silverstone and he got the maximum out of it. He demonstrated in 2010 that he could fight for the championship and he is showing it again now. You never know what can happen through the year but he is doing a good job, in second place behind Ferrari's Fernando Alonso, and he has managed each race very well. As I have said in this column before, you're going to need consistency to win this championship, not just race victories. The key is to get the maximum out of every situation and keep on scoring points. And the two most consistent drivers so far are in first and second places in the championship. The last two races in Britain and Valencia have changed the shape of the championship battle. Before then, it was wide open. Now, it seems to be between Alonso and the Red Bull drivers. They are not only the teams who have been most consistent since the start of the year, they are also the ones who have made most progress - especially Ferrari and Alonso, who is having a fantastic season. But Alonso has his work cut out because Red Bull are on a slightly higher level than Ferrari, especially in the slow-speed corners. The car upgrade Red Bull introduced in Valencia is a fantastic system, with the exhausts helping air blow through a hole in the floor. It is giving them so much downforce - and it is especially effective at low speed, with braking and traction. McLaren, meanwhile, have fallen back. Because of various operational problems, they did not make the most of having the best car at the start of the season and now they are paying the price for that. There is still a long way to go. The next race in Germany marks the mid-point of the season and a lot can still happen. But right now, in terms of consistency and performance, you would have to put your money on Ferrari and definitely Red Bull. It's difficult to be exactly sure what has gone wrong for McLaren so quickly. Four races ago in Spain, on a track that has similar characteristics to Silverstone, Lewis Hamilton was on pole by more than half a second before he got a grid penalty following a team error. Yet at Silverstone McLaren were struggling for pace. At least part of it is down to some misunderstanding of the tyres. That's especially the case for Jenson Button, but Hamilton was also struggling with tyre temperatures at the weekend. At the start of the season, when we went to Australia and saw both McLarens on the front row, I was convinced this would be their season. The cars just looked fantastic out on the track. It was obvious even then that this season would be about consistency and I thought Button was the favourite because he always tends to get the maximum out of what he can without making too many mistakes. But now Button is really struggling and McLaren have slipped back in terms of performance. They still often look quick in Friday practice, but then they are struggling on Saturdays and Sundays - to the extent that I am beginning to wonder whether they are running the cars with less fuel than other teams on Fridays. Following the race in Spain, McLaren have been very inconsistent. They were OK in Monaco, the fastest in Canada, and have now struggled in both Valencia and Silverstone. It appears as if they are lacking aerodynamic downforce in all conditions. In Canada, you need a good engine - the Mercedes that McLaren use is the best - and not much downforce. But in Valencia you need more downforce in the slow corners, as well as good traction, while Silverstone requires efficient high-speed downforce. And in both races they struggled. They also need to look at Ferrari and Alonso and learn the lessons that even if your car is not the quickest at a given race you have to get the most out of it. Scoring consistent points is critical. McLaren have lost a lot of ground to Ferrari and Red Bull, both in terms of performance and points, but they are a great team and have demonstrated in the past they can improve their car very quickly. So I wouldn't write them off just yet. Jaime Alguersuari drove for Toro Rosso from 2009-11 and is now a Pirelli F1 test driver and BBC 5 live analyst. He was talking to BBC Sport's Andrew Benson.